November Member Meetups - After the amazing election results in Virginia and across the country on November 7, there was a lot to celebrate and our meetups were markedly more festive! For the first time, we had monthly meetups in THREE cities: Kunming, Shanghai and Beijing. In December, we hope to add a fourth meetup in the Pearl River Delta. 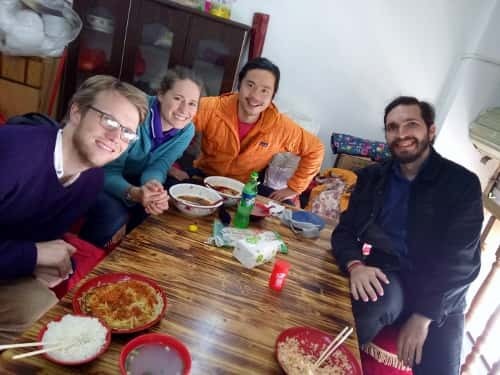 Led by Brian Kloosterman, Kunming members met up for the first time to get to know each other and think about ways to reach out to other Americans in the area. The meetup in Shanghai was hosted by David Henry, with members gathering for a Sunday brunch. Board members Faith Gary and Sam Wong attended. In Beijing, James Bernard hosted a group to discuss organizing voter registration plans for the Gulou area and other expat hubs in Wudaokou and Sanlitun. Board members Aaron Kruse and Elizabeth Jenkins also attended. 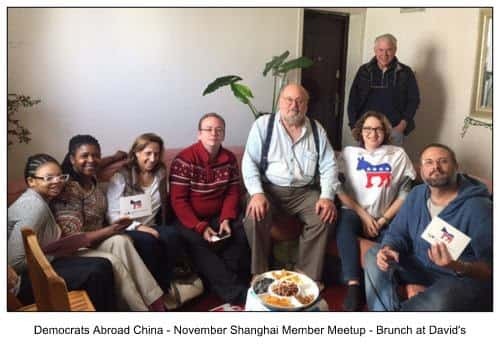 Thanksgiving in Shanghai: Democrats Abroad members in Shanghai gathered at Al's Diner for a Thanksgiving feast! We are so thankful you could join us.